The following are clothing related terms from the sources I used to create this section on Middle Eastern dress. Where possible multiple references have been consolidated. It is possible that the same word can refer to different items in different regions or time periods (think of the differences in meaning between British and American English). It is also possible that the sources got things wrong. farasia Tilke Morocco long shirt like garment with wide sleeves and buttoned over chest - often belted and made from light fabric. gamis, gamisa Morocco & maghrib djebba with sleeves. Also known as a kefijeh - although some sources use this to refer to the skullcap. Palestine a scarf - roughly square worn as either a headscarf or a baggish head covering by unmarried women or folded like a band - `asbeh - by married women. jillayeh Palestine Women's heavily ornamented body garement - either a short sleeved front opening coat in the north (around Nazareth & Galilee) or a dress in the south. Tilke also refers to the farasia as a "kaftan" despite it only opening partially down the front. kandura Tilke Tunisia see gandura. kasabia Tilke Tunisia see gasabia. kofia Tilke Arabia see kefijeh. kutiyah Anawalt Arabia skullcap - see kefijeh. mandil Egypt women's headscarf often edged with pom-poms. Here is how to make a mandil for dance. masar Keohane Oman men's (traditionally woollen Kashmiri) scarves wound like a turban. Here is how to make a Westernized version for dance. Syria wide women's trousers tied at waist and below knee with the extra length falling to ankles. 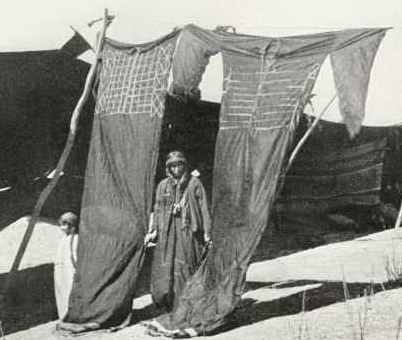 thob'ob Keohane Bedouin very long thob - up to 3m from shoulder to hem - the skirt of which has a fold ('ob) and tucked into the belt. That is a double dress. Here is a photo of a thob'ob from 1937. And here is a clip of a women wrapping a tob'ob from the 1920s. thobe general Arabic term for clothing, garment, dress or robe. thobe nashaal Gulf States an ornate women's robe used in the "hair tossing dance"
Here is how to make a version for stage. tulle bi telli Egypt, Levant flax based net with metallic embroidery. Well known examples were made in Asyut, Egypt which let to it being known as "asyut"
The cloth is known as shaal, the result imma or ihram.